With freshly grated zucchini, apple sauce, vanilla and allspice, this deliciously easy-to-make healthy vegan zucchini bread can be enjoyed for breakfast, snack, or even dessert. It’s moist and satisfying without being overly sweet. I love this recipe because it is only lightly sweet, yet bursting with flavor. It is sweetened with apple sauce, apple juice concentrate, and maple syrup. No eggs are required at all. 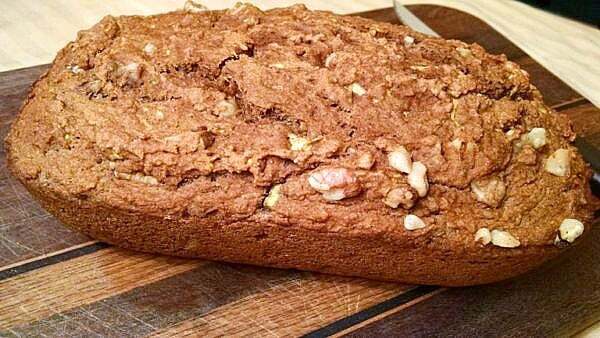 Zucchini bread is delicious for breakfast or snack. Baking with zucchini is the perfect way to use up all that zucchini in the garden during the summer. It’s so exciting to be able to fill my freezer with loaves of this delicious zucchini bread. We have neighbors that usually have boat-loads of zucchini in the summer, and they love to share the bounty, which I am very thankful for! Even if you don’t have a garden, zucchini is relatively inexpensive all year round. Whole zucchini fresh from the garden. 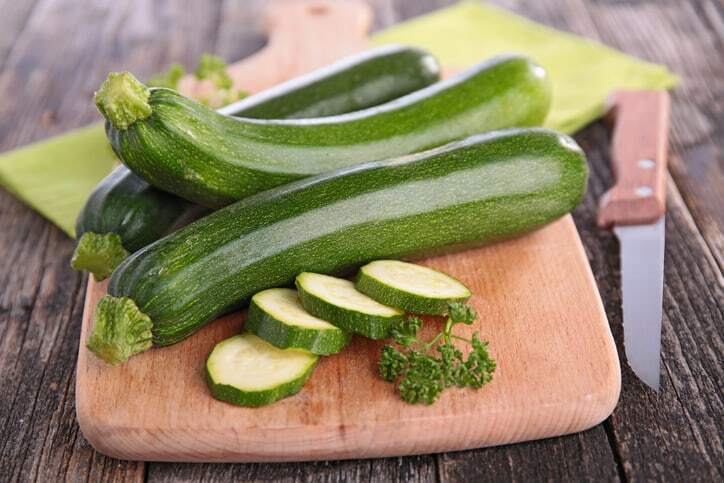 A staple at many farmers markets during the warmer months, zucchini, which is a type of summer squash, and it can range in color from yellow to deep green. Serve as breakfast, snack, or dessert. I really like this healthy vegan zucchini bread served warm! I often hear people say they need ideas for quick and easy breakfasts, because they don’t have time to make anything in the mornings on their way out the door for work or school. This zucchini bread is a great option. It can be made over the weekend and eaten for breakfast throughout the week. Vegan oil-free zucchini bread is easy to make and so delicious! Another great thing about this recipe is that it can be frozen and thaws back out deliciously. Whether left out on the counter to defrost naturally or placed in an oven or microwave to speed up the process. Either way, this warm up very well! Recipe adapted from Breaking the Food Seduction by Dr. Neal Barnard, President of Physicians Committee. With freshly grated zucchini, apple sauce, and allspice, this deliciously easy-to-make zucchini vegan bread can be enjoyed for breakfast, snack, or even dessert. It's moist and satisfying without being overly sweet. 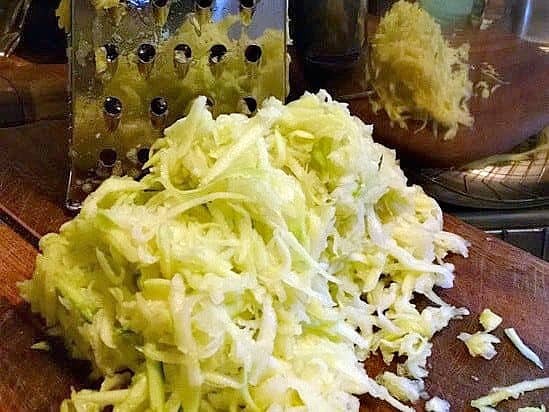 Grate 2 cups of zucchini, which is approximately 2 small. 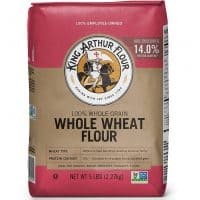 Place flour, baking powder, baking soda, cinnamon, and allspice in a large bowl and whisk together. 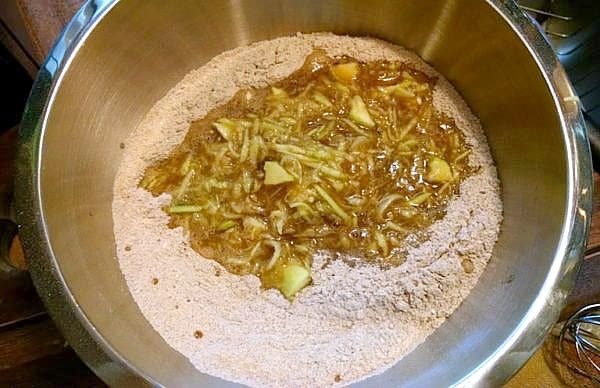 In a separate bowl, whisk together apple sauce, apple juice concentrate, maple syrup, and vanilla. 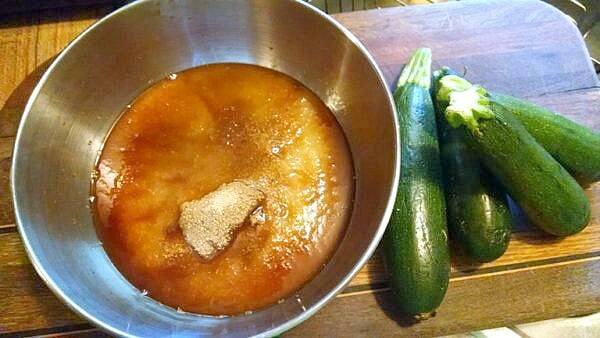 Add grated zucchini to wet mixture and stir until blended. Pour wet ingredients into dry ingredients. Mix just until dry ingredients are evenly moistened. Stir in walnuts, if using. Spoon batter into non-stick loaf pan. Bake on center rack of oven for approximately 50 minutes, or until tooth pick inserted into the center comes out clean. Turn bread out onto a cooling rack and let cool completely before slicing or storing. Serve as breakfast, snack, or dessert. I really like it served warm! Delicious for breakfast or a snack. How can I adapt this for a low-sugar diet?